Good morning! So my Day 3 Digit-al Dozen mani may be a bit of a stretch for the tape mani theme. (However, I would argue that this technique is "tape-like". LOL.) But it doesn't matter anyway. I'm totally obsessed with it. I can be a bit of a perfectionist, so the Incoco French Tip nail polish appliques are like a miracle. I used the appliques in a modified way. This look was done with Incoco French Tips in Lemon Fizz and Essie Butler Please. 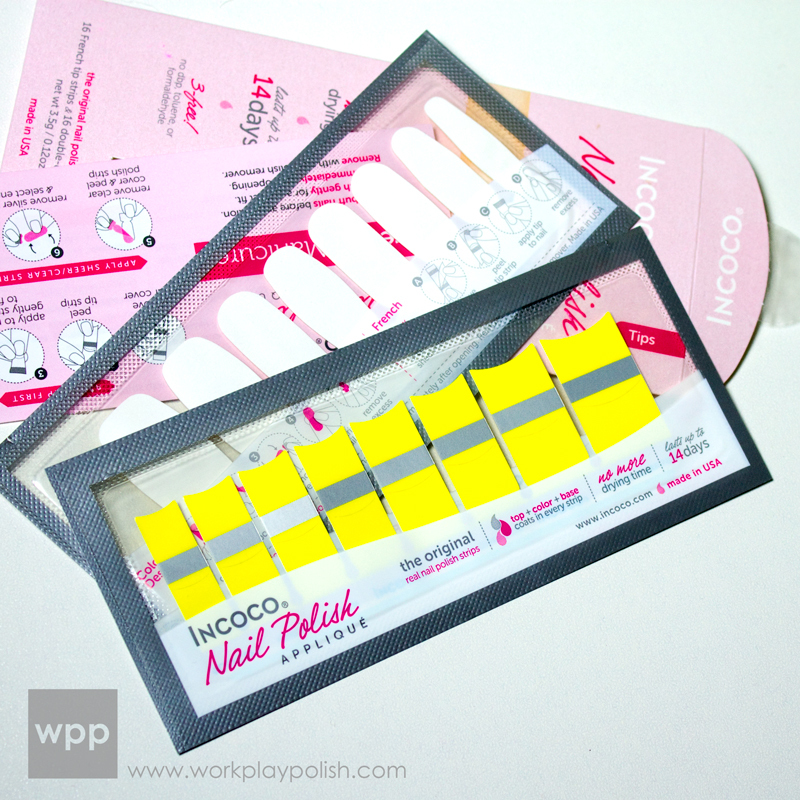 Incoco appliques are made of real nail polish. Each strip includes base, color and top coats in one. The French Manicure package contains 16 French tip strips and 16 clear strips. 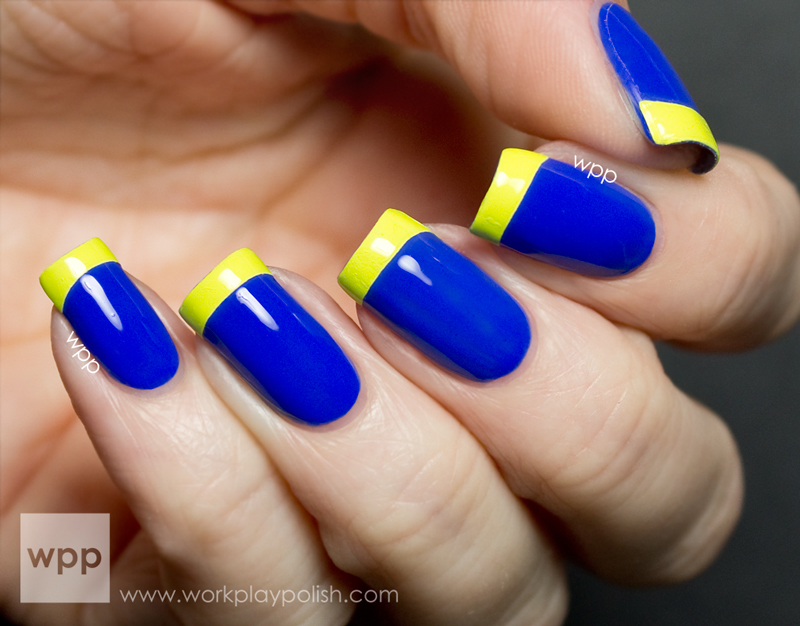 You can apply the tips directly to a bare nail, but I immediately thought to put them over a darker color. It's so difficult to get a crisp French mani with a bright tip over a dark base because you have to layer the tip color over white...so things don't line up well and the tip is thick and it can be a hot mess. 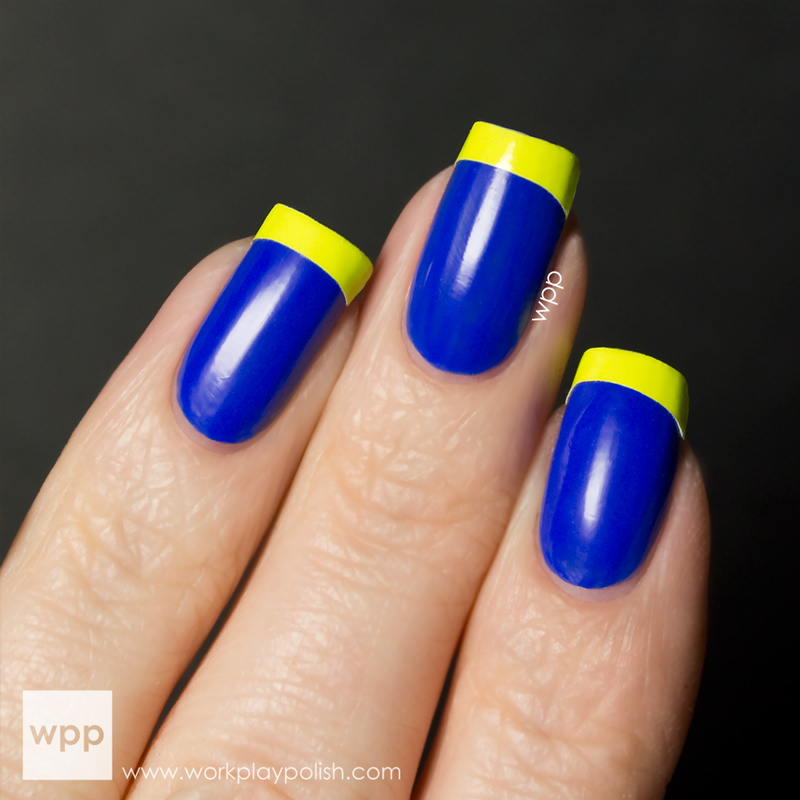 With the appliques, you can have a crisp, thin, ultra-bright tip over even the darkest base. I started with two coats of Essie Butler Please, an almost-but-not-quite neon blue. I applied the strips per the instructions (video here). Usually, I have an issue finding the right sized nail strip for my narrow, curved nail beds. 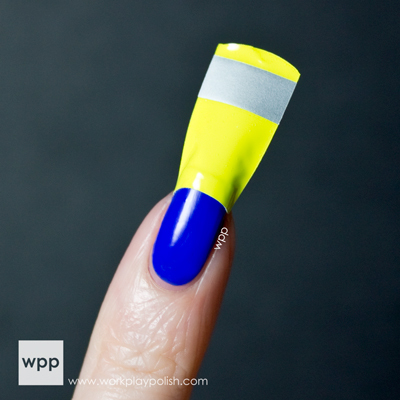 But the tips are foolproof since you can use even the widest tip for your smallest nail. Just remove the extra width like you remove the extra length by creasing the strip along the nail edge and filing off the excess. Normally when applying nail polish strips, I have a few "do overs", but every tip went on perfectly the first time. The pic below was taken right after the tips were applied. I contemplated stopping here. Whenever I do a French mani, I tape off the tips...which means I have to use a quick dry top coat over the base...which means the base is shiny. So I really like the look of a semi-matte French nail. I covered the entire thumb nail with a clear strip like described in the instructions (you can see it in the first pic above if you enlarge it). This seemed to work well and would likely provide extended wear (although I didn't test it for wear time). It was shiny, but not quite as shiny as I prefer. So for the rest of my nails, I covered the nail and tip with a generous coat of Seche Vite. I love this look! Incoco has a huge variety of strips available. You can purchase them online at www.incoco.com. Prices range from $7.99 to $9.99 and shipping is free for orders over $50.